Starbucks is redefining inclusion via a new concept: a D.C. location that features baristas that are fluent in American Sign Language. Every barista that works at the Starbucks Signing Store is fluent in American Sign Language (ASL), and many are even Deaf themselves. There's no music piping from unseen speakers overhead. 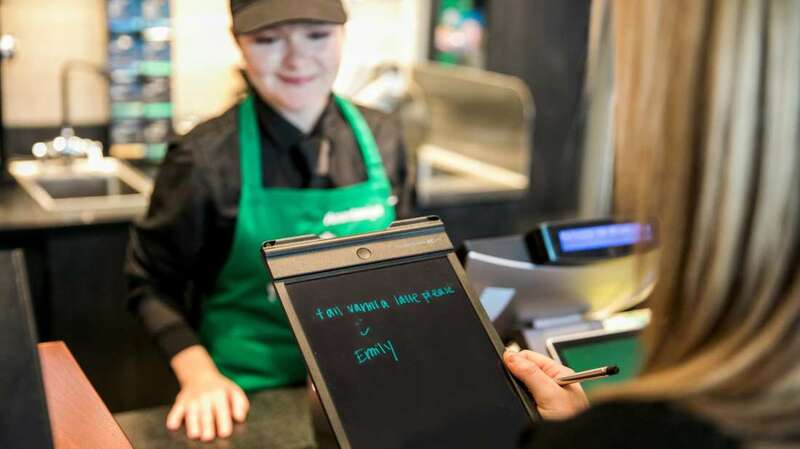 Tablets are provided so customers can order in writing, if needed, and baristas can respond in kind. Lights are brighter, too, and surfaces are made with matte materials to reduce the amount of glare (because people who are hard of hearing are so reliant on their eyes, adequate lighting is of utmost importance). 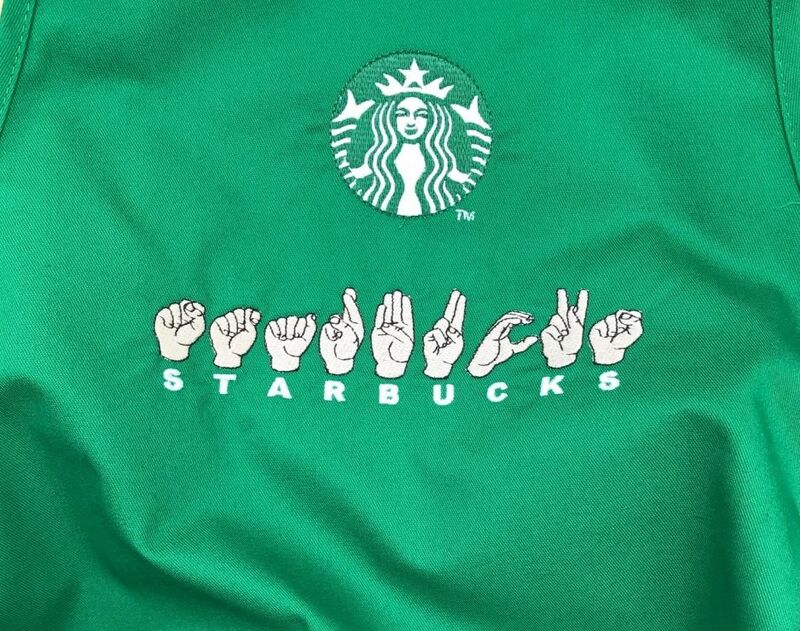 Wherever it's written, the Starbucks moniker also appears in ASL fingerspelling. Everything about this Starbucks -- from its design to the people -- signifies its celebration of the Deaf community and its dedication to making a coffee shop experience that "signers" (as they like to be called) can enjoy, too. “This is a historic moment in Starbucks' ongoing journey to connect with the Deaf and hard of hearing community, hire and engage Deaf and hard of hearing partners, and continue to find ways to be more inclusive, accessible and welcoming to all,” Rossann Williams, Starbucks executive vice president of U.S. Retail, said in a statement. 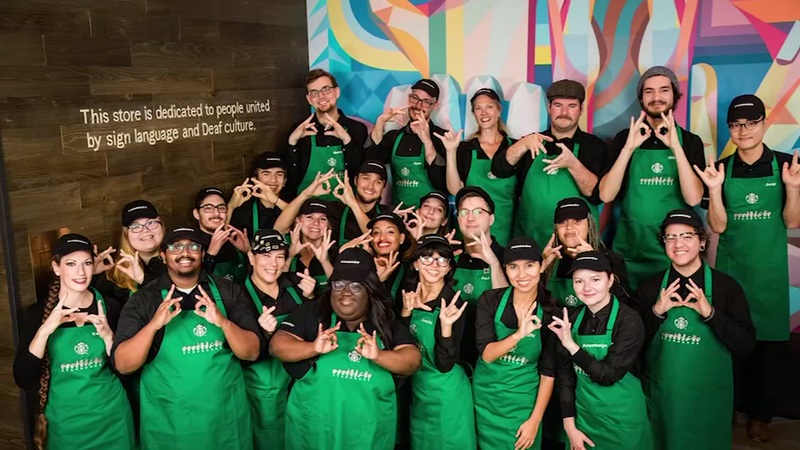 The Deaf community is excited about the Starbucks Signing Store for two major reasons: first, its very existence begins to fill the gap in the community's chronic underemployment situation, allowing signers to be employed in a meaningful way. Second, it provides a signer-friendly space and atmosphere for gathering and socialization, in addition to home and work. While it's the first Starbucks of its kind in the U.S., there is one other similar Starbucks in Kuala Lumpur, Malaysia. It opened on Tuesday, October 23, and is located at 6th and H Street in Washington, D.C. So what do you think? Would you like to see more of these Signing Store concepts catch on? Which business should offer it next? Tell us in the comments below! This isn't the only way we're ahead of the game: D.C. was voted one of the "greenest" cities in America! Read all about it here!